Effective product for manual washing of dishes. Does not contain dyes or perfume. Therefore very mild for the skin. For almost all daily cleaning activities in the kitchen: floors, tiles, tables, pots and pans, equipment et cetera. 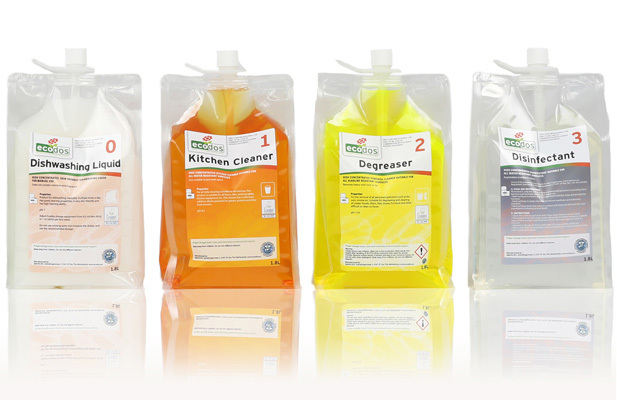 Extremely suitable for industrial kitchens and as a soaking agent. For the cleaning of heavy soil, such as fat, soot and smoke. Suitable for the degreasing and cleaning of cooker hoods, filters, tiles, stoves, furniture et cetera. For quick and safe disinfection of all water resistant surfaces. Registered in the Netherlands (10016N), Belgium (4709B) en Germany (N-35837) by the name Quatdes. *Use the disinfectant safely. Always read the product information and label before use.